Holy Crap. This turtle has gone wild! I am about to be on the receiving end of some heinous turtle attack that will be featured on one of those Discovery channel about dumbasses who end up being bitten by the Only spider of its kind in the known world and practically die specials. The last thing my daughter and her best friend will see is my hand, falling into the fetid water of the culvert as the turtle drags me to its lair. Awesome story and you are so funny and so kind. I'd love to know why children engage in animal play. One of my daughters did this extensively for 3 - 4 years, I was starting to wonder and worry a little. Other kids got tired of playing this way, still she insisted on continuing. She had a whole dog alter-ego and the play (pretending to be a dog) would continue even during non play activities. She's 8 now and it's finally tapered off quite a bit. 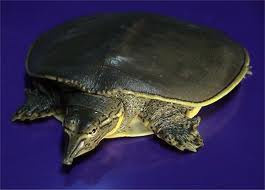 It's a spiny softshell turtle, I think...a very cool species!